The Strangers was released in 2008 and stars Liv Tyler and Scott Speedman. The film revolves around a young couple who are terrorized by three masked assailants at the remote summer home in which they are staying. Marketed as “inspired by true events”, writer and director Bryan Bertino stated that the film was inspired by a series of break-ins that occurred in his neighborhood as a child, as well as some incidents that occurred during the Manson killings. 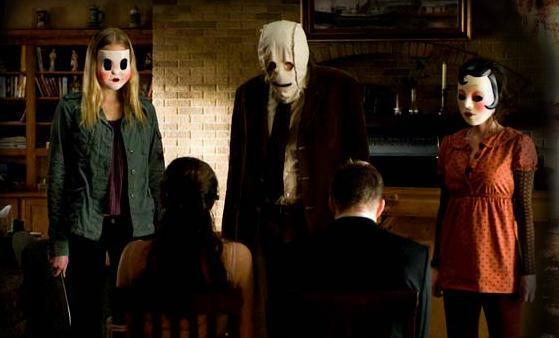 Coming in at a runtime of only 86 minutes, does The Strangers deliver or disappoint? The film begins with a recorded 911 call where a boy screams that he and his friend found two bodies lying in blood in an old vacation house. Kristen McKay and James Hoyt arrive at a remote summer vacation house owned by James’s parents after attending a friend’s wedding reception. James had proposed to Kristen there, but she refused. James calls his friend Mike to come pick him up in the morning. That is literally everything you will learn about these characters which is one of the movies biggest flaws but I’ll go into more detail about this later in the review. Kristen and James discuss his proposal and it’s established that Kristen refused because she simply isn’t ready. Why isn’t she ready? How long have she and James been together? You never find out. There is a knock at the door suddenly, a young blonde woman, whose face is obscured by low lighting asks if Tamara is home. When James and Kristen tell her she is at the wrong house, she asks if they’re sure, and leaves shortly after. James leaves to get Kristen some cigarettes. Not long after, Kristen hears another knock on the door; the same woman has returned to ask for Tamara again. Kristen refuses to open up. During the following minutes, she hears strange noises, and her cell phone goes missing. As her fear grows, she eventually hears a noise from the back door and grabs a large kitchen knife. She approaches the curtains, to find a man wearing a sack mask staring back at her. Panicked, she hides in the bedroom until James returns. When she warns him of what had just transpired James investigates. He finds his car has been ransacked and the blonde woman, now wearing a doll mask, watching him from afar. He also finds that his phone has had its battery stolen and realizes the house has been breached. The couple attempt to leave in James’ car, but a third stranger in a pin-up girl mask drives a truck into his car, totaling it and forcing them to flee back inside. Kristen and James find a shotgun and take refuge in a room. Soon after, Mike arrives early and is accidentally shot by James, mistaking him for an intruder. Devastated, James nevertheless remembers an old radio transmitter in the backyard shed. He leaves the house and encounters and attempts to shoot Pin-Up Girl, but is ambushed by the masked man. 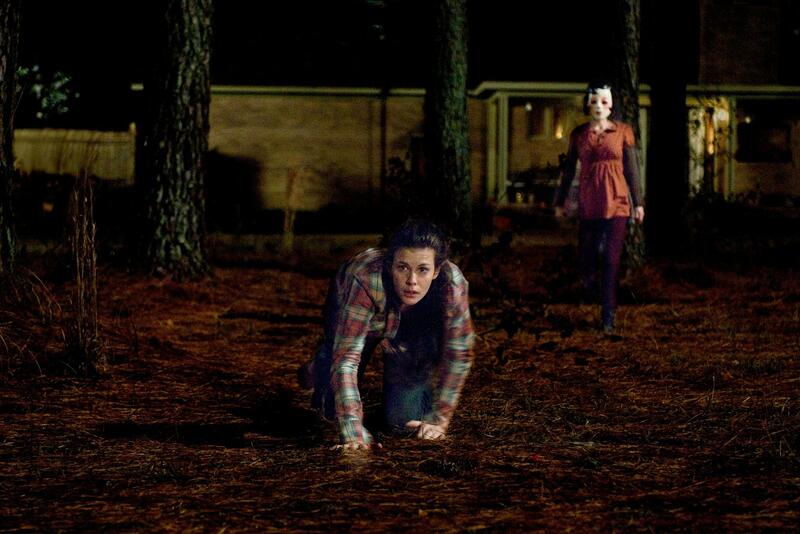 Kristen hears a shot and decides to make a run for the shed. There, she finds the radio, which she uses to try and contact someone for help, but Pin-Up Girl appears and smashes the radio, so Kristen flees back to the house. There, Kristen is confronted by Dollface, who is now armed with a knife. The masked man arrives with the captured James and the gun and incapacitates Kristen. What will happen with Kristen and James? Will they make it out alive? What do the strangers want? Has the beginning of the movie already spoiled the conclusion? You’ll have to watch to find out. So that was The Strangers and it’s a flawed movie. The whole concept of a home invasion isn’t anything new but it’s still a creepy concept and it’s executed quite well. The scene involving the blonde girl asking if Tamara was there is as unsettling as you can imagine if something like that happened to you. The biggest problem with the film are the two main characters. Neither Kristen or James are developed in the slightest so it’s quite hard to even care if they make it out alive. You never learn much about them other than their names. Not only this but they’re both really damn stupid and make some very cliché horror movie mistakes throughout. Kristen doesn’t call the police when she has the opportunity, she calls James. Also, she approaches windows etc. slowly when nobody in their right mind would do so. Kristen trips and falls and is just generally not portrayed as being very intelligent. James actually has the good idea of getting their backs to a wall and pointing a gun at the door. However he somehow ends up blowing his friends head off. I know that’s all sad and everything but it doesn’t change the fact that what they were doing was a damn good plan. James decides to then go outside and try to be a hero only to be caught like 30 seconds later, what an idiot. Another thing, there are only 3 intruders. These masked people are human and they can’t be everywhere at once. If either James or Kristen had decided to run into the night in any direction, there is no way the intruders could have stopped them. Not to mention the fact that 3 on 2 are not exactly the worst odds and the strangers don’t even have guns! However, I cannot deny that the movie is supported by great acting. I really liked the fact that the strangers’ faces are never seen and they never speak except for that one awesome line that I wrote above. The film has a decent premise that has potential to be scary but it relies too heavily on jump scares in the second half which ultimately falls flat. 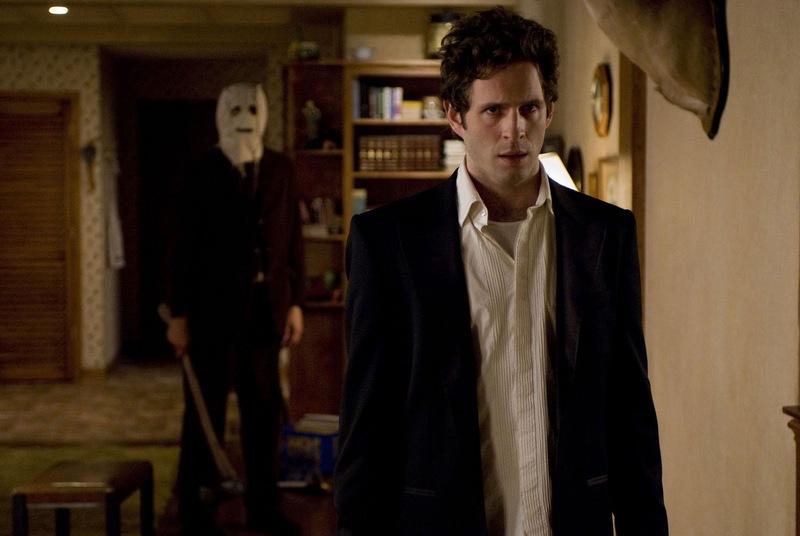 The Strangers is definitely a film of two halves, in the first half the creepiness is done in a much more subtle realistic way but then in the second half the characters make some really strange choices and the film turns into a jump scare fest.